Come May, Hansel and Gretel will bound and spin out from the wings to the center of a warm, lighted stage, and charm an audience with this beloved fairy tale by the Brothers’ Grimm. But this is February, and it’s a cold and windy Saturday morning outside the drafty old studio. Benjamin is wearing loose pants and a baggy shirt. Kelsey is in leotards and a sweater. They could be kids hanging out at any mall in the country, but on this Saturday they are focused on Anne’s tutelage. Anne has danced ballet on New York Stages. She has done Cinderella, and Sleeping Beauty and Peter Pan and “every role in the ‘Nutcracker,’” she says with a wry smile. This spring’s project, though, is Hansel and Gretel — and Benjamin and Kelsey must master the opening movements on this blustery Saturday morning. Gradually they assume their characters. They become the woodcutter’s children — skipping and playing, unaware of the dark times ahead. The movements are practiced in silence until Anne thinks the music should be added, and she starts a boom box on a table at one end of the dance floor. Kelsey has worked with Anne before. 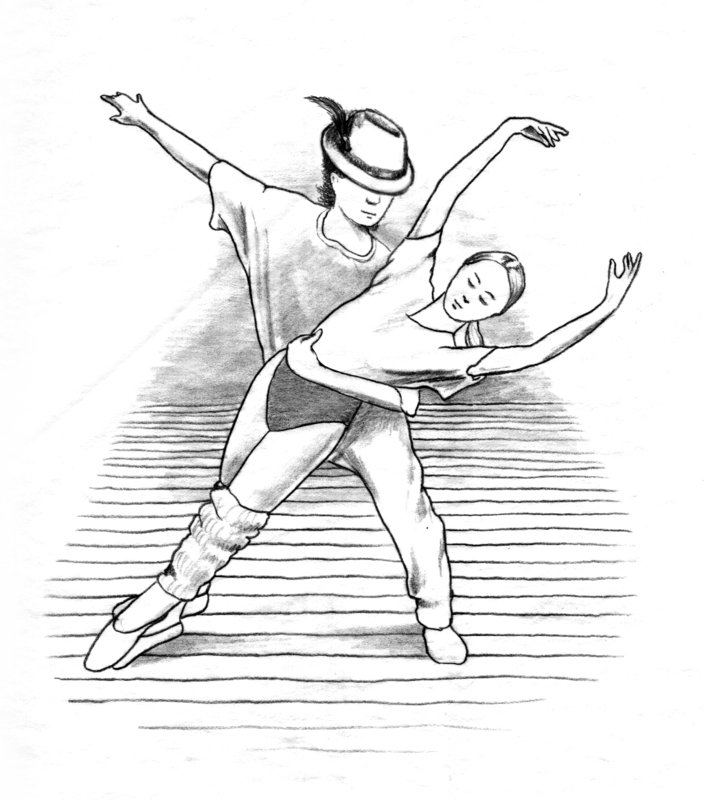 On a particular sequence, Anne reminds her, “Kelsey, this is nothing but part of the Sugar Plum Fairy routine!” Benjamin is not quite as polished, but he knows the ballet principles — and his Tai Chi and martial arts training give him body control that he can adapt to the dance. I am there at Anne’s invitation. I sit on a well-worn metal chair off to the side, but I soon realize that I am invisible to the three people. They are focused on the few square meters of stage on which they perform. Anne often demonstrates particular movements with practiced grace. I suddenly realize that I am witnessing something special. I find a scrap of paper in my jacket pocket and a stub of pencil. I try to recollect what I have already seen, and begin taking notes. There is a short break. Kelsey removes her point shoes for some adjustment or other, and I see that some of her toes are bandaged. I see a spot of blood. A box of Band-Aids is among the contents of her small duffle bag. Hansel doesn’t have to do anything en pointe, and Benjamin has worked in his socks all along. The break over, he and Kelsey – warmed to a sweat now — are down to T-shirt and tank top as they resume the rehearsal. Over and over, they do the same opening sequence. The music is added at almost every iteration now, as the piece becomes more polished. I feel like clapping, but realize that I mustn’t interrupt the concentration of these amazing energies. Next fall, Benjamin will return to classes at the College of Charleston and Kelsey will enter the University of South Carolina. Before that, though – in May — there is Hansel and Gretel. Benjamin will be wearing lederhosen — those leather britches — and a snappy Tyrolean hat. Gretel will be in braids, and a Bavarian girl’s costume. An appreciative crowd in comfortable seats in a warm auditorium will applaud their skills. But that’s a long way to go. It’s February and they’re in old clothes and leotards, in a drafty old studio, repeating moves over and over, before an audience of one — and waiting for Anne’s “Bingo!” to let them know when they’ve nailed it. Hansel and Gretel in February was first published in “Senior Scribbles Unearthed,” a collection to Chuck Thurston’s columns and essays, available from Indigo Sea Press or Amazon. A second collection, “Senior Scribbles Second Dose,” is also available. What fun, Chuck, to be part of a creative process! So cool. We watched a TV series with ballet training but your post makes it even more real. Coco and Sheila — tks for the comments. It truly was special. Anyone who says these kids aren’t athletes is nuts!